£2-3pp at the door towards expenses please. Please note we’re back at The Cloisters, Catherine Street, Salisbury, this month, after the Christmas session at St Thomas’s. £2-3pp at the door towards expenses please. Please note we’re back at The Cloisters, Catherine Street, Salisbury, this month, after the Christmas session at St Thomas’s.John and I both wish you all a happy, healthy and creative New Year. Our theme this time is ‘Resolution’ or if you’re inspired to some very vivid writing, ‘High Resolution’. 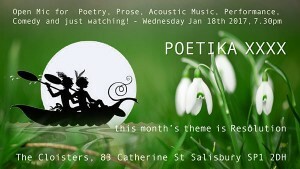 But as always, we welcome songs, poems, etc on any topic, your own work or anybody’s that you’d like to bring along. Electric eclectic, is our traditional motto that I’ve just invented, we don’t mind, the main thing is just to roll up and enjoy the evening, performing or listening: extra voices, ears, always welcome. safe close to improvise hot magic there? 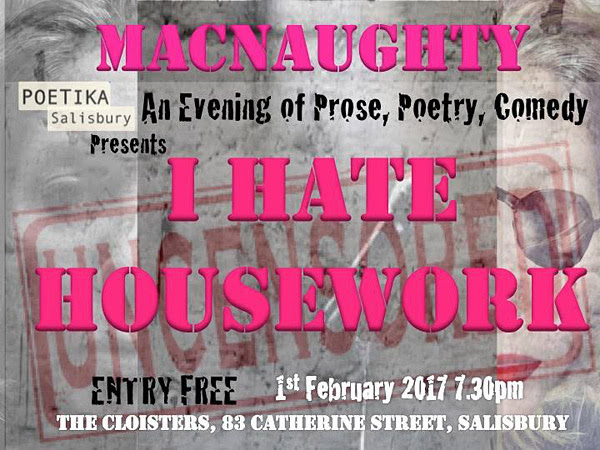 PS don’t forget our extra event on 1st Feb – “I Hate Housework”- an evening of prose, poetry and comedy. Do come along and support a very funny and thought provoking show by one of our members, Clare Macnaughton. It’s completely free – no contribution for the room on this occasion. 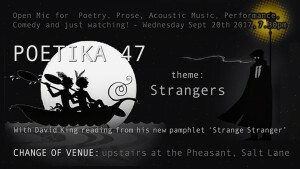 Despite the fact the Poet Laureate did not attend our meeting on Wednesday – probably because she hadn’t been invited – we had another good turnout including new faces and some welcome returners. Many followed our theme by reading some of Carol Ann Duffy’s work, but there were plenty of original contributions too.’Parking seems to be getting harder, despite the large Brown Street car park behind our venue, so it may be worth allowing an extra few minutes if you’re coming by car. David King did the customary introductions before beginning with Prayer by Ms Duffy – “the truth enters our hearts, that small familiar pain” then followed with something of his own, though he “can’t stay here, because the air’s too thin”. Graham ‘Gray’ Turner continued by “feeding the chickens that laid the golden eggs on our fantasy world”, then Edwin read us History by Ms Duffy – “She’d seen them ease him down from the Cross, his mother gasping for breath, as though his death was a difficult birth”. Vic brought us a musical interlude where he sang of Salisbury’s dancing man, where watchers were ‘itching to move their feet’, then Mike dribbled about ‘toddlers with tools they may grow up to use”. John made sure he was first to jump the Christmas gun by reading the Laureate’s ‘Christmas Eve’, before reminding us all of the sad news that Leonard Cohen had died, by reading his ‘Poem’ – “I hear a man climb stairs and clear his throat outside our door “. 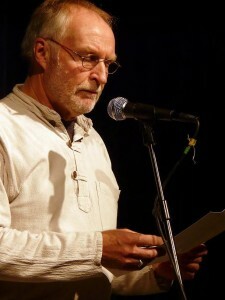 David Robinson followed this with a further tribute to Cohen – ‘The Stranger Song ‘ – “I told you when I came I was a stranger”, before James surprised us all with his assertion that he knew Carol Ann Duffy “before she was gay”. It was nice to see Papa Webb back to wonder why King Kong or Godzilla had never won an Oscar, and how he’d been “at sea all day, and caught Rockall”, and Inga, who told of “blue grey eyes, that make women want you”, and she wished “that you could be me, for one hour”. Nicky followed with ‘Stealing’, by Carol Ann Duffy – “You don’t understand a word I’m saying, do you?” before performing one of her own – “uncertainty is the new certainty”. 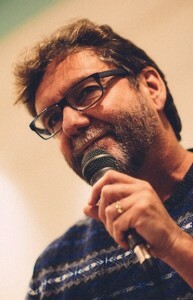 Alison read Cohen’s ‘A thousand Kisses Deep’ – “And then consented to be wrecked, A Thousand Kisses Deep”, Lenka then gave us her Autumn Sketch – “is an afternoon walk, before the dusk brings its dark shadows”, and David King wound up the first half with another from Duffy – ‘Drunk’ – “unseen frogs belch in the damp grass” – was he suggesting something? The second half saw David King get us going with Duffy’s ‘Litany’ – “A tiny ladder ran up Mrs Barr’s American Tan leg”, before David Robinson returned with a short selection from her collection ‘The World’s Wife’ – including Mrs Icarus and Mrs Darwin. Mike was back with more flash fiction – “squinting through a wall you’ve always found opaque”, and Papa Webb entertained us again with a cautionary tale about the dragon at the door. It was Vic’s turn again and he brought us Duffy’s ‘The Dark’ – “there’s nothing to be frightened of at all. (Except for aliens…)” then performed for us Leonard Cohen’s famous ‘Bird on the Wire’. Inga returned having been asked “do you want a hand with that, Luv” and told “get down you crazy mare”, and Nicky told us “this kid’s so unpopular, even my imaginary friends have left me”. Lenka treated us to a short children’s poem in her native Czech, ‘Little Bear’, and was good enough to translate it into English for us too. David King then closed proceedings, warning us that “time is a thief in black and white” and that “we rarely notice how fast slowness happens. It was another great meeting, and thank you all – everyone who came to share their and others’ work, and also those who came just to listen. Our next meeting will be the Christmas one – now we meet on the third Wednesday this means it will be very close to Christmas – on the 21st of December – and we do hope you’ll be able to come. We’ll be meeting in a different venue to leave the Cloisters free for Christmas dinners and also to allow us to bring our own Yuletide refreshments – so make a note – for next month only we’ll be meeting in St Thomas’s house – on the corner of the walk through between Dinghams and Cote Brasserie (was Snells) – St Thomas’s Square. Opposite St Thomas’s church. We’ll be providing mince pies and a little alcoholic and non-alcoholic refreshment as there is no bar (you are welcome to bring your own), and our theme will be Christmas – and traditionally we celebrate the lighter side of the season – so bring your more humorous work! But more details in our event invitation nearer the date.